Today we continue our examination of some of the fires that have ravaged Newark neighborhoods and the city's business areas, starting with the High Street tragedy in 1910. 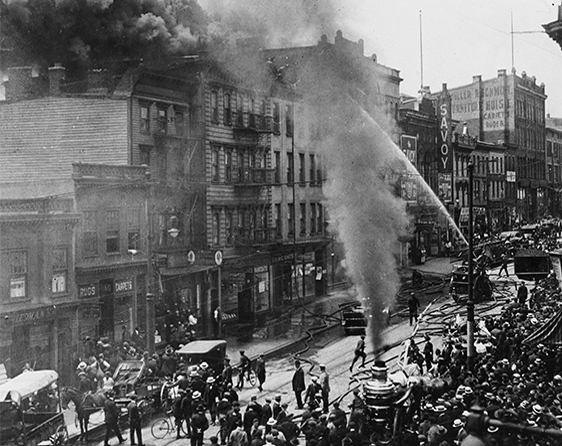 The fire that killed 27 women on November 26, 1910, remains the worst fire disaster in the city's history. The four-story brick factory at 216-228 High St., now Martin Luther King Jr. Boulevard, was our own corner in Hell in 1910. Though just across the street from Engine Company No. 4, the fire swept through the factory so quickly that death and destruction ensued before the station was even contacted. At 9:30 a.m. on the day of the disaster, which began on the factory's third floor, the foreman, instead of giving an alarm, ran down to the basement to get a fire extinguisher. News accounts noted that a torrent of flames 'licked along the oil-soaked floor and leaped to the ceiling of the top floor within minutes.' At the same time, a girl who had been on the third floor ran across the street to the firehouse to tell of the fire. Still, no alarm had been called in. In less than five minutes the building was engulfed in flames. The fire started when an employee of the Anchor Lamp Co. set off an explosion while using gasoline to clean a carbon lamp. On the floor above, in the Wolfe Muslin Undergarment Co., 100 women panicked upon learning of the fire below. Rushing to the hallways, they found the exit blocked by bodies, oil-soaked rags, fire and smoke, forcing them to retreat to the windows. As the fire intensified they began leaping to their deaths. According to the news account, 'While firemen poured water onto the burning factory and made what rescues they could against heavy odds, three wagons from Mullin's morgue on Washington Street arrived and the undertakers set about their sinister business.'' Three priests from a nearby Catholic Church administered conditional absolution to the mangled forms of the women, and the ambulances from several hospitals hurried back and forth from the factory to the hospitals with the injured and dying.' Ghastly sights greeted rescue workers, including a 'female form impaled on a rail fence, a charred body of a woman on the fourth floor seated at a sewing machine where she had apparently collapsed with heart failure, and the blackened bones of a human body found in the corner under a mass of plaster and debris.' Others lay dead where fire nets had broken, their bodies broken upon contact with the ground. So terrible was the scene that even seasoned firefighters and policemen were treated for the shock. For days after, the newspapers reported, 'church bells throughout the city tolled for funerals of the victims, and local newspapers were relentless in their demands along with the Newark Board of Trade and the Essex Trades Council for increased worker safety and reform. The catastrophe brought about change in local ordinances. The following year the building code was revised. Following suit, the state of New Jersey required factories to hold periodic fire drills, a lesson unheeded by our neighbors in New York. Just four months later 146 lives were lost in the Triangle Shirtwaist factory fire. On May 14, 1915, a fire at the George Stencil Co., where enamel and automobile leather were manufactured, caused the death of two Newark firemen. They were among firefighters who spent 10 hours battling the blaze. Leather manufacturing is a highly combustible activity involving linseed oil, naphtha and pigments along with niter-cellulose compounds. A Newark newspaper gave this account: 'The fire was spectacular, being visible for miles, and attracted a large crowd. Train service along the Pennsylvania Railroad had to be halted for several hours, and there was grave danger of the fire spreading to the Wesson Electrical Instrument Company.' Later, it was discovered that the incident was caused by defective wiring connecting an electrical motor, which could have been prevented with the installation of an ordinary sprinkler system. The fire also emphasized the need for high-pressure water service in the industrial section to handle emergencies requiring large amounts of water and strong water pressure. In 1918, a fire broke out at the American Button Works' three-story brick factory at 70 Morris Ave. on September 17. Seven girls, a man and a boy died. Like the High Street fire, little attention had been paid to fire safety. Instead, the rush to complete World War I manufacturing orders was considered more important. More than 200 women were in the crowded workplace at the time. Many of us tend to remember the fires for what they destroyed. For me, the memory lingers of a major gas tank explosion along the New Jersey Turnpike, hotel blazes, church conflagrations and toxic or environmental emergencies. Great flashy fires include the inferno that occurred April 20, 1968, with the destruction of 35 buildings in a five-block area of the Central Ward. According to The Star-Ledger, 'The flames danced toward the sky, ballooned around, darting out shafts of purple, red and orange and electric cables made loud cracking noises as they snapped, sending sparks and embers into the air.' That year, there were 195 fires, taxing the resources of the Newark Fire Department, which had 550 men on duty, aided by 115 men from 16 other communities. In 1972, three Newark firemen were killed in a Lincoln Park fire started by two juveniles. According to Newark's chief firefighter, this was one of the 'darkest and saddest and most tragic in the entire history of the fire department.' Twelve Newark residents also were killed in a blaze on December 7, 1978, in a tenement. As in other cases, fire officials said the problems of fighting fires in Newark centered on the huge number of deteriorating houses built before 1940. In recent years, many hotels and restaurants have disappeared because of fires. They include the Lucerne Hotel fire of January 5, 1987, where seven died. The once-elegant Continental Hotel was torched by a jobless laborer who had been charged in a double murder. The landmark Military Park Hotel, now the site of the New Jersey Performing Arts Center, was the site of a holiday tragedy when a Christmas tree fire killed several visitors. The hotel telephone operator died trying to warn guests of the danger. Subsequent legislation prohibited live Christmas trees in public spaces. Newark has also been a place for large and disastrous church fires. Israel Memorial A.M. burned in 1967, and the grand old First United Methodist Church on Market Street was deliberately set on fire when gas jets were left burning. St. Luke's A.M. Church, the second-largest African Methodist Episcopal Church in New Jersey, was lost to a smoky fire in January 1981, and the old South Park Presbyterian Church was gutted in July 1992, leaving only the Greco-Roman facade as a reminder of happier days along Broad Street. In December 1997, what some consider a miracle happened when St. Casimir's Polish Roman Catholic Church in the Ironbound survived an explosion and fire. Since the 1970s, a rash of chemical explosions has rocked the city. In 1979, a fireball shot 350 feet into the air, blowing up the Arlington Warehousing and Packaging Corp. In October 1982, McKesson Enviro System, a chemical salvage concern, worked to contain an overflow of chemical and fuel oil that threatened to seep into the Passaic River. In 1983, the Texaco tank blast of January killed one and injured 23. It resulted from an overflow of fuel oil into its tank facilities. In February 1986, an explosion at the ETO Sterilization Co. launched a cloud of nontoxic spice dust into the air. Ever vigilant to the needs of the community, the Newark Fire Department continues to stay one step ahead of the danger that lurks within the city's industrial areas. Whatever the challenge, the department stands ready to help.